We use a particular rice variety that is only grown to make sake, sakamai. We have the rice grains polished so that only 60% of each grain remains: this is the key to the quality of the sake. The more polishing, the better the sake, but also, the more care is required in keeping everything stable during the manufacturing process. This remaining part of the grain is where the good stuff lies and which the brewing process is able to access, unlocking the starches that aid the brewing process. The whole brewing procedure is best done in winter, when temperatures are low and potential contamination from airborne bacteria is least likely, though with careful temperature control the brewing season can be extended. 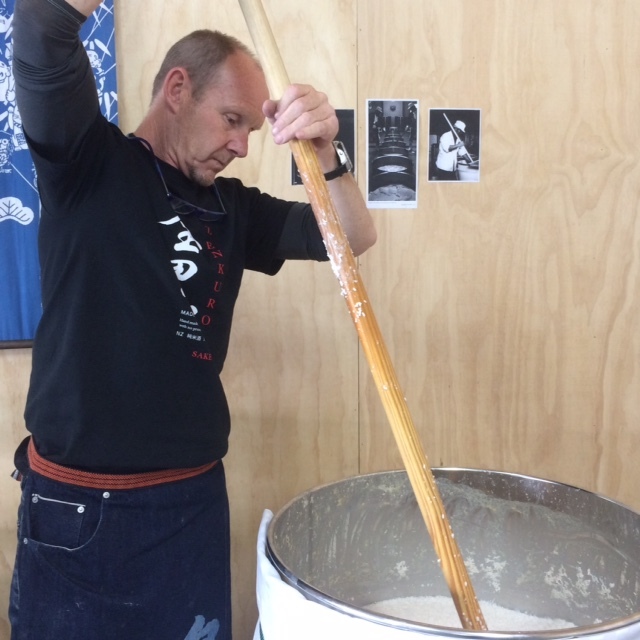 Our Master Brewer laboriously washes and then soaks the rice to get it ready for steaming. The steamed rice has an almost rubber-like texture and after cooling is ready for the introduction of koji. Koji is also a rice product, best thought of as a malted rice, a rice that has been fermented. We rely on the expert Japanese miso paste maker Urban Hippy in Nelson to make this for us, using our polished rice. This koji mixed with the steamed rice and water is added to create a mash, which is where the magic and the hard work starts. Stored in stainless steel tanks, stirred regularly, constantly monitored for temperature and the characteristic stages that the brewing process naturally goes through, our Master Brewer is never far from the tanks, sleeps near them, dreams about them …. and agonizes over his creation. When the bubbling reaches the right speed, the right size bubbles are appearing, and the temperature of the mash is dropping to where we want it, we start the pressing in special muslin bags that contain the sake kasu but allow the raw sake to permeate into the tank. 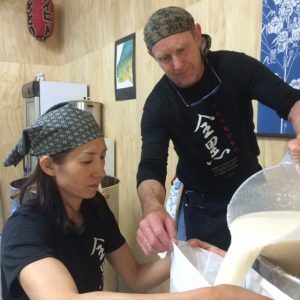 The raw sake can be up to 18% alcohol at this point, but we bring it down with the addition of pure New Zealand water at a later stage to a more palatable 14.5%, the same as the table red and white wines that we are all used to. This should dispel the image many have that sake is fire water which knocks you off your feet! Our sake is then left to stand and mature in holding tanks, in carefully controlled conditions for 2 months, when it is ready for bottling and pasteurization.